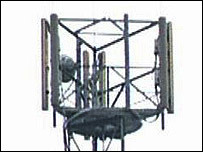 A blockade by parents has prevented a mobile phone mast being erected on school grounds. The T-mobile mast was supposed to go up at Chipstead Valley Primary school in Coulsdon near Croydon. A large crane required to put up the mast was barred from entering the property by dozens of parked cars. The protestors fear radiation from the mast could be damaging to children but Reigate and Banstead Borough Council said they were powerless act. Kevin Browning, whose children attend the school, said many parents were worried about potential health risks for pupils. "There is clear evidence to show that these masts are harmful for children," he said. "The council is clearly in breach of its promise to look after its constituents." He added: "We look forward to any dialogue with them, angry or not." But a council spokeswoman said that under government legislation no planning permission is needed for certain masts. She said: "The General Permitted Development Order is government legislation which allows mast operators to erect certain masts without seeking planning permission from the local authority, therefore we have no control over the development."